Provide students with a caring and supportive learning environment that addresses their individual needs. Utilize innovative teaching techniques delivered by a superior faculty. Incorporate performing arts into the core curriculum in reading, language arts, math, science and social studies. Employ learning opportunities that maximize students to achieve both artistically and academically. 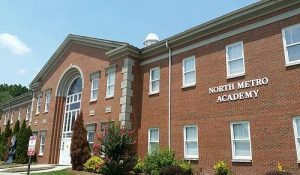 Established in 2014, North Metro Academy opened their doors to Gwinnett County residents to offer an educational alternative that is personalized to the needs of local children. Students have the opportunity to develop unique interests, uncover hidden talents, experience satisfaction in accomplishments, gain a sense of responsibility, and pursue education as a way of life through educational programs tailored to their own specific needs. Such practices include, but are not limited to; smaller classroom sizes, alternative and researched based instructional methods, professional development opportunities, and individualized and differentiated instruction. North Metro Academy of Performing Arts approach to creative learning is unique, highly personalized and guaranteed to ensure you meet your potential. We integrate performing arts into rigorous Common Core based academic curriculum. We offer Gwinnett County families an educational alternative that is personalized to our scholars’ area of interest. Each scholar has the opportunity to develop unique abilities, uncover hidden talents and gain cultural experience while pursuing an education tailored to their special needs. The founder and Board Chair is a native of Baldwin County, Georgia. Mrs. Beauty Baldwin is a graduate of Savannah State with a B.S degree in Mathematics. She also has a Master’s degree in Vocational Education and Administration and Supervision from University of Georgia and a Specialist in Administration and Supervision, also from (UGA). Her educational experience includes teaching Mathematics in Schley, Muscogee, and Gwinnett Counties in Georgia for 10 years. She served as a Vocational Education teacher for four years, Assistant Principal at Central Gwinnett High School (Lawrenceville, GA) for two years and Principal of Buford Middle School (Buford, Georgia) for four years. Mrs. Baldwin retired in June 1994 as Superintendent of Buford City School (Buford, Georgia) after 10 years of service. North Metro Academy of Performing Arts, a free Gwinnett County Public Charter School, engages students in instruction that integrates academics and performing arts in ways that address the unique needs and interests of each student, while intentionally developing confidence, imagination, and collaboration.